Some months ago, Venkatesh was a man with full of dreams and ambitions. His deepest pain was not able to continue his education due to family circumstances. As soon as he completed his PUC he started working on a farm as a daily wager to support his family. He believed that he can regain those lost moments through giving the best education to his children. He was working day and night for it. Now, his life has taken a drastic turn, he fears he may not be able to support his family due to the dreaded disease - cancer. Venkatesh is just 27 years old. He hardly had any health issues. He was a healthy and hardworking person. A month ago, he got a high fever, he thought he just needs a rest and it would settle down in few days. As days passed by his condition became worse, he was not able to even get up from the bed. His temperature was too high and he was taken to a hospital. Shilpa, his wife and he thought it must be a viral infection. A series of tests were taken. When the doctors asked them to sit down they knew a bad news was coming but nothing could have prepared them to hear those dreaded words. They were devastated beyond words when doctors said that he has blood cancer. "I did not fear about death, I feared to leave my children and wife alone. How can I do that? what will happen to my children? I was so broken and I did not know what to say to my wife. I had never seen her crying so badly. We were lost completely." - Venkatesh. Venkatesh lives on the outskirts of Bangalore. 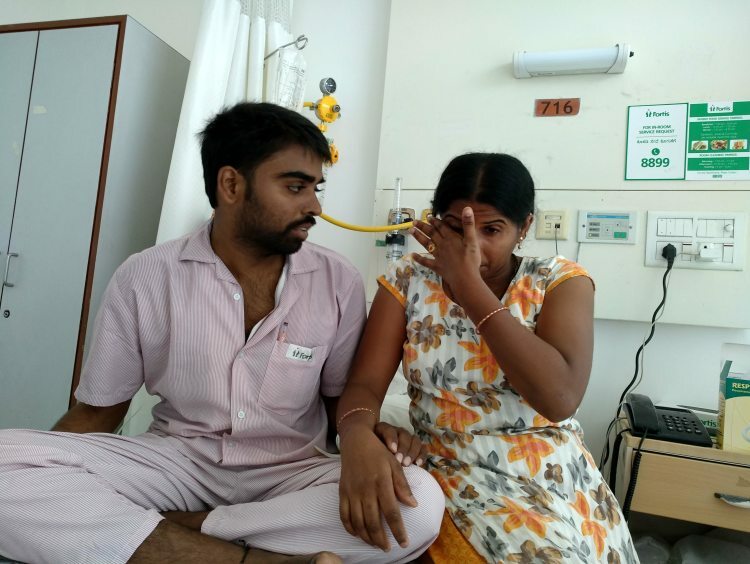 It was a very tough decision for Shilpa to remain at home while Venkatesh's sister accompanied him to the hospital in Bangalore for treatment. Shilpa is forced to stay at home because she cannot take her 2-year-old daughter Thanmai to the hospital. She does not stay with anyone but her mother. Her 5-year-old son Keshav is going to school. 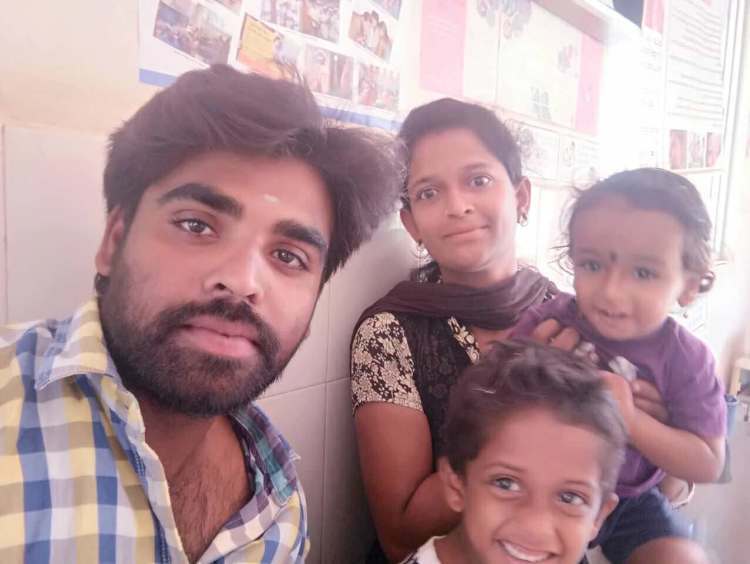 Venkatesh's family is left in despair. His mother and sister are worried, children are confused about the absence of their father, Shilpa is struggling to come to terms with the reality. 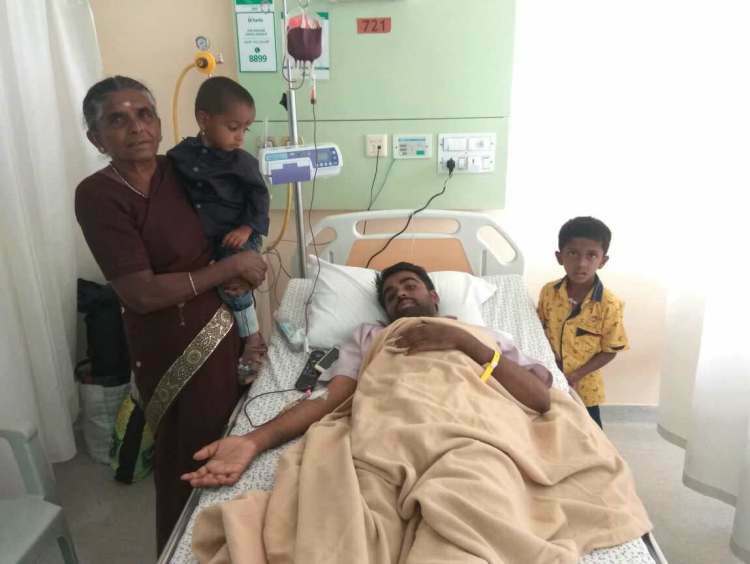 He is undergoing blood transfusion every day. The painful journey has just begun and it has already taken all their hope and happiness. "I don't know how my wife is managing the situation, how can she say it to my son? I should have been taking care of my family but they are all around me now, crying and fighting hard to save me. I can't bear this. I dread at the thoughts of the impact of the chemotherapy. How will my daughter recognize me? I don't even know if my body can endure the pain but I have to. I have to live for my children. I can't leave them helplessly." - Venkatesh. 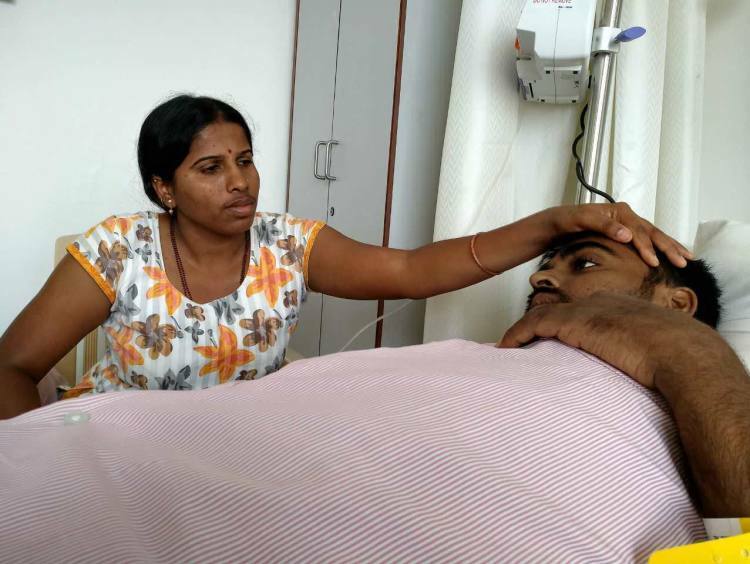 Venkatesh's sister Lakshmi is taking care of him. She is trying hard to be strong and support her brother but she breaks into tears seeing the pain he is undergoing. Venkatesh is the pillar of his family, everyone dreads at the thought of their family and lives falling apart. 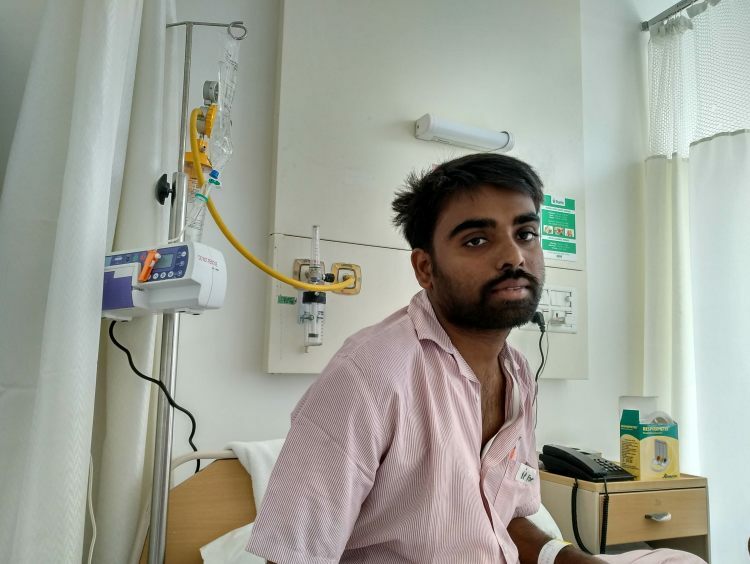 Venkatesh needs chemotherapy for 6 months and a bone marrow transplant to survive. He will not survive if the treatment is not given at the right time. He may have to quit the treatment because they do not have enough money. What worse can happen than this? They tried to pull out everything they had and it counts only to few thousands. They are struggling to make the ends meet. 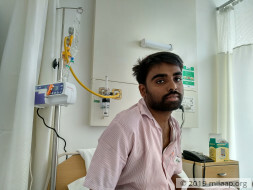 Venkatesh is desperate to have the treatment and get back to his family. His family needs him, their life would be upside down without him. He cannot survive without the treatment.They do not know whom to turn to help. Venkatesh was earning Rs 300 per day on an average. They have nothing to sell and have exhausted all the sources. They need your support, only your support can save his life. Your contribution can give him a chance to live his life! Unfortunately, with inexplicable grief, we're having to inform you all that Venkatesh passed away. 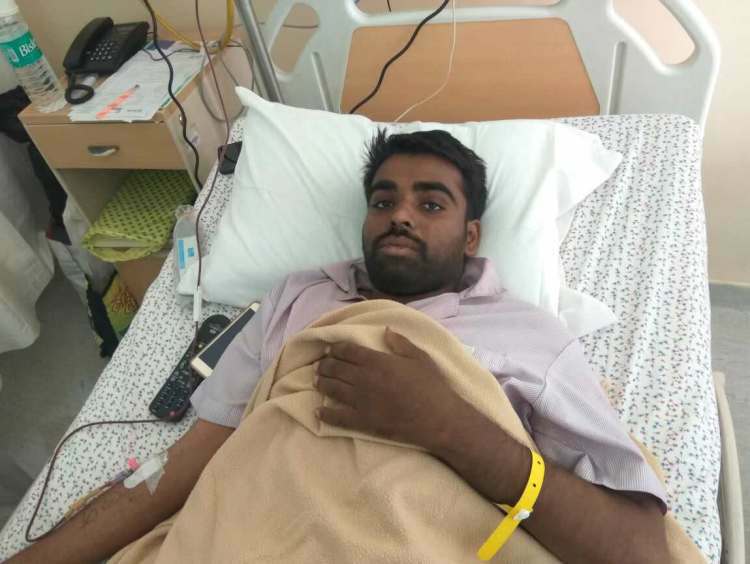 He had begun his induction chemotherapy at the hospital and got discharged in a stable condition and was expected to come for regular follow ups but due to unexpected complications he passed aaway before getting admitted. 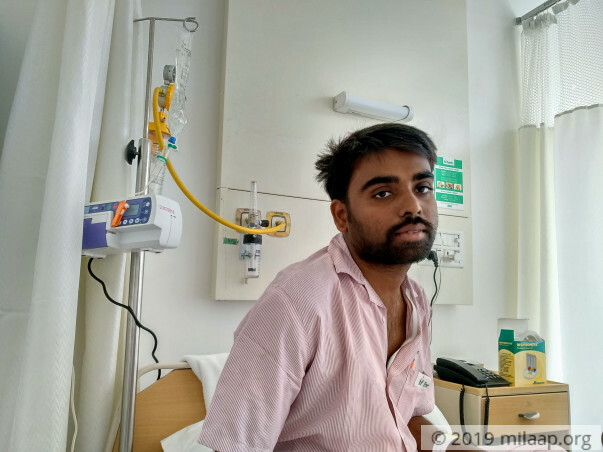 The remaining funds upon discussion with the family and the hospital will be used towards Kumar's treatment. However, in case you would like to opt for a refund, please reply to us by 9th of August and we will be happy to initiate a refund for you. 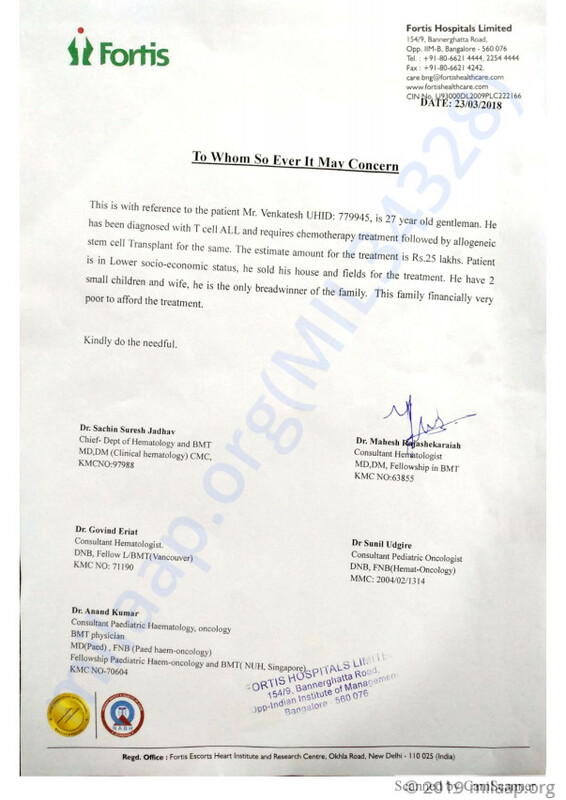 After which all the funds raised via this campaign will be transferred towards Kumar's treatment.